The recent trend of sleeve and lace wedding dresses first began to emerge on the scene with the appearance of Princess Kate Middleton in an Alexander McQueen couture gown. 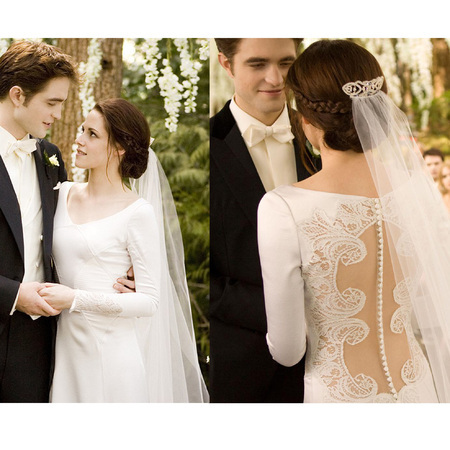 The popularity of this wedding dress style has further been enhanced by the gown that Bella Swan wore during the highly anticipated wedding scene of Twilight: Breaking Dawn. A wedding gown with lace sleeves will be a timeless option for any bride who wishes to look her best on her big day. David's Bridal Short Sleeve Satin Gown With Beaded Lace - This traditional gown is imbued with a modern twist with short, lace sleeves. The entire gown features a romantic lace overlay that has been embellished with beading throughout. A chapel train completes the fairy tale appearance of this gown. Mon Cheri Lace Cap Sleeve - Mon Cheri is a designer who has been at the forefront of pioneering the trend of lace wedding dresses. This chiffon A line gown features a sweetheart neckline, ruched bodice, and delicate and feminine cap sleeves that are constructed from lace. A sweeping train completes the look of this gown. JoyFay Delicate Mermaid Gown With Long Lace Sleeves - From JoyFay Delicate comes this classic mermaid style gown. The gown features a square neckline and long sleeves that are constructed from high quality lace. The bodice of the dress has been embellished with delicate embroidery, and the sweeping train of the dress features a lace overlay. Plato Bridal Lace Wedding Dress Off the Shoulder Lace Sleeves - This particular wedding dress offers a unique twist on lace and sleeve wedding dresses. Rich lace appliques have been added to the dress over a soft tulle. The portrait neckline has been endowed with crystal embroidery and off the shoulder lace sleeves for a romantic and feminine appearance.